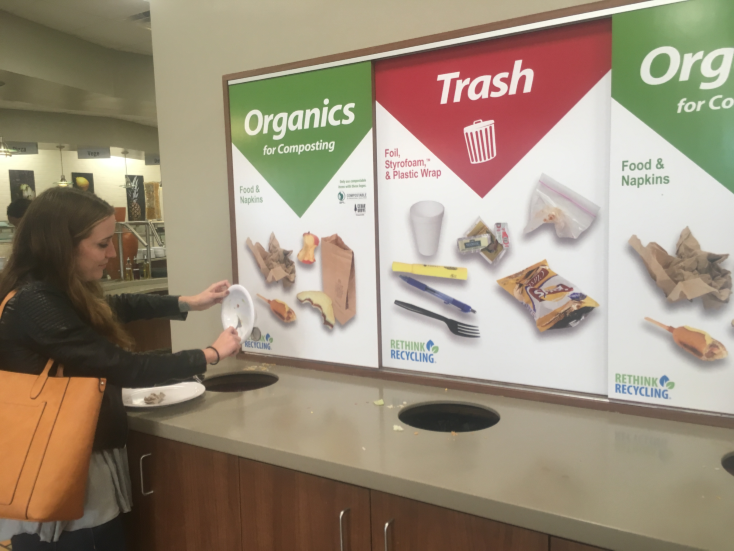 Reduce, reuse, and recycle – a mindset crucial to environmental stewardship on our campus and in our lives. All our campus computer labs encourage double-sided printing in order to reduce paper use. At Augsburg, students, faculty, and staff actively support an extensive recycling program. We also encourage reuse through the re-use table in the lower level of Christensen Center; there, members of the community rediscover the old truism that one person’s trash is another’s treasure. Most public printers on campus are capable of printing on both sides of the paper, and this is the default in the largest computer labs. This has significantly reduced the volume of paper sent through the printers (most of which ends up in the trash or recycling bins eventually). Many office printers can also print double-sided – ask your LFC. The Re-Use Table is located in the lower level of the Christensen Center, outside the Event Services offices. This is a place to leave new or gently used office supplies that are no longer needed. Anyone may take what they need from the Re-Use table – better for items to be used than thrown away! The Women’s Resource Center (Sverdrup 207) maintains clothing racks for swapping women’s clothing items you no longer need. Hang your clean items on the rack, and take clothing that fits you and your lifestyle. This is a “swap” service, so please bring your used clothing if you’re going to take an item. Augsburg has a recycling contract with BFI for recycling of cans, glass bottles, plastic, paper, cardboard, and yard waste. Labeled recycling bins are located around campus, including the residence halls, offices, computer labs, and public spaces. For detailed information on the types of materials that can be recycled, see the Recycling Program User Guide. The volume of materials recycled has been steadily growing, year by year. Did you know? Since 2005, all printer and copier paper on campus contains 30% post-consumer recycled content. This is specified in the contract with our paper vendor; we share the contract with other ACTC schools. Appliances, carpet, auto batteries, and some scrap metal. Facilities Management recycles these items. Yard waste. Yard waste (i.e., grass clippings, leaves, branches) is kept in a separate dumpster for composting. Furniture. Schools, shelters, and other charitable organizations have benefited from Augsburg’s cast-off furniture. Laser printer cartridges. The company that provides toner for all of the University’s printers also collects empty cartridges from public printers for recycling (either refilling or materials recovery). If you have a University-provided printer in your office, ask your LFC about returning those cartridges too. Electronics. The Information Technology department sends shipments of unusable computer equipment to a materials recovery effort in Stillwater once a year. Any valuable components are removed and the rest is disposed of in an environmentally responsible manner. Inkjet printer cartridges. A number of offices on campus, including the Women’s Resource Center, house collection boxes for used inkjet cartridges. The cartridges are recycled and the proceeds go to charity; the charity is usually specified on the collection box.